To date, the published clinical experience with the use of CT fluoroscopy to guide percutaneous needle biopsy is limited. Katada et al. reported results of 60 CT fluoroscopic procedures in 57 patients, including 36 with CT guided intrathoracic procedures . In their study, the target nodule was punctured on the first attempt in 83% of patients and the average number of passes for all nodules was 1.3. A diagnostic result was obtained in 32 (97%) of the 33 patients who underwent lung biopsy, including 17 malignant and 15 benign lesions. In a single subcentimeter lesion, the needle tip was visualized in the nodule but there was insufficient tissue for diagnosis. Mean procedure time was 54 min (range 24-139 min) with an average of 74 sec of CT fluoroscopy time for each puncture. The authors reported 17 (47%) complications among the 36 thoracic procedures, including 16 pneumothoraces and 1 episode of hemoptysis. Five of the pneumothoraces were treated either with aspiration of pleural air or placement of a chest tube. Katada et al. concluded that the real-time capability of the CT fluoroscopy permitted reduction in the number of needle punctures required to perform the biopsy and provided substantial overall advantages over standard CT . The early experience at our institution with CT fluoroscopy to assist in the biopsy of small pulmonary nodules has also been promising . 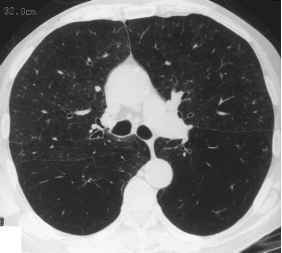 Figure 3 A 56-year-old man with a 1.5-cm left upper lobe nodule. Image from a CT fluoroscopy segment shows the needle traversing an area of bullous disease posterior to the nodule. Adenocarcinoma was diagnosed. We performed procedures on 17 patients with nodules less than or equal to 1.5 cm. In most cases, we used a coaxial biopsy technique and the interrupted real-time CT fluoroscopy method (Figs. 3 and 4). Similar to standard CT, the needle tip was routinely identified by its characteristic low-density artifact. Figure 4 A 65-year-old man with a 1.0-cm right upper lobe nodule. Computed tomography fluoroscopic image shows needle sampling this ill-defined lesion (arrow). A diagnosis of non-small-cell cancer was established. Figure 5 A 67-year-old man with multiple left pleural nodules. Image from a CT fluoroscopic segment demonstrates the needle within a pleural nodule. 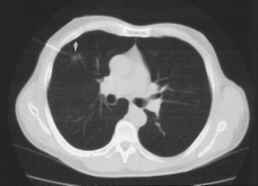 Biopsy showed sarcoidosis. (From Ref. 14). We established a diagnosis in 16 (94%) of the 17 lesions, including 11 malignant and 5 benign nodules. A single nondiagnostic biopsy occurred in a patient with small, deep lesion who requested discontinuation of the procedure after a single pass. 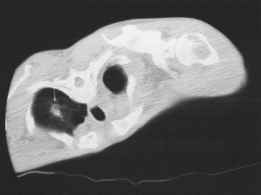 At surgery, this lesion proved to be a non-small-cell carcinoma. The mean lesion depth in our patients was 7 cm. The mean number of passes was 2.5. The average fluoroscopic time for each puncture was 103 sec. Good image quality was obtained using dose factors of 30 mA and 120 kVp. The mean room time was 91.5 min. Complications in our series occurred in nine patients (53%), including eight with pneumothorax and one with hemoptysis. Two patients with pneu-mothoraces required chest tube drainage. Both our series and that of Katada et al. had similar rates of success and complications [2,16]. It is likely that the increased number of punctures required and higher use of CT fluoroscopic time in our series is due to the smaller size of the nodules. Other factors such as the need for supervision of a resident or fellow may also have contributed. In addition to use in the lung, we have found CT fluoroscopy guidance valuable to biopsy lesions in the pleura (Fig. 5) and paraspinal region, mediastinum, and chest wall. In these areas, the real-time capability may permit the operator to avoid traversing lung parenchyma.